Jacqueline Lee Bouvier Kennedy Onassis, known in the 1960s as Jackie Kennedy, and later as Jackie Onassis, was the wife of President John F. Kennedy, and First Lady of the United States from 1961 to 1963. 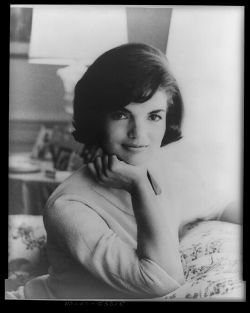 From the time of John F. Kennedy's election to the U.S. presidency in 1960, through his assassination in 1963, and for the rest of her life, Jackie's name and image were symbolic of social grace and elegance, beauty, glamour, and fashion sense. Her life was riddled with trials and tragedy yet she always kept her dignity. Mrs. Kennedy's gallant courage during the tragedy of her husband's assassination won her the admiration of the world. Always concerned about the safety and security of her children Caroline and John Jr., after their father was killed she felt the only way to keep them safe was to marry the Greek shipping magnate Aristotle Onassis. She was not in love with Onassis, in fact, she was forever in love with John F. Kennedy. Jacqueline Lee Bouvier was born in Southampton, New York, into New York society. She was the elder daughter of John Vernou Bouvier III and Janet Norton Lee Bouvier Morris. She was of mostly Irish, Scottish, and English descent; her French paternal ancestry is distant, with her last French ancestor being Michel Bouvier, her great-great-grandfather. In Washington, D.C., she briefly attended the Holton-Arms School. Jackie was joined by a sister, Caroline Lee, in 1933. Her parents divorced when Jackie was a young girl. While her father never remarried, her mother wed the wealthy Hugh D. Auchincloss, Jr.
As a child, Jacqueline became a well-trained equestrienne and began a lifelong love affair with horseback riding. She won several trophies and medals for her riding, and the ample land at the Auchincloss's Hammersmith Farm gave her something to appreciate. She loved reading, painting, writing poems, and sharing a warm relationship with her father. Her relationship with her mother, though, was often distant. Jacqueline attended elementary and middle school at the Chapin School in Manhattan, New York, and then college preparatory school at Miss Porter's School in Farmington, Connecticut. She began her college education at Vassar College, in Poughkeepsie, New York, and was named "Debutante of the Year" for the 1947–1948 season. During her junior year at Vassar, Jacqueline studied abroad at the Sorbonne in Paris. When she returned home, she decided not to return to Vassar for her senior year, and instead transferred to George Washington University in Washington D.C., where she graduated with a degree in French literature. In 1951, Jacqueline took her first job as the "inquiring camera girl" for the Washington Times-Herald. Her job was to ask witty questions of the people she met in Washington, D.C. The questions and amusing responses would then appear alongside the interviewee's photograph in the newspaper. One of Jacqueline's subjects for this assignment was a young Massachusetts senator: John F. Kennedy. Jacqueline was engaged to a young stockbroker, John Husted, in December 1951. However, this engagement was called off in March 1952, at the advice of Jackie's mother, Janet, who felt Husted was not affluent enough. Jacqueline first met Senator John F. Kennedy at a dinner party in Washington on May 10, 1952. The dinner party was organized by mutual friends, Martha and Charles Bartlett. Hoping to talk to Jackie privately after dinner, JFK followed her outside. When he arrived at her 1947 black Mercury convertible, he turned around upon seeing a man leaning on the car. As it turned out, the man was an acquaintance of Jackie’s who just happened by and, recognizing her car, decided to wait for her to come out so he could say hello. He had no idea he had stymied a lot of hard work by the Bartletts, who had hoped to set up JFK and Jackie. Nine months later, the Bartletts hosted another party, reintroducing JFK and Jackie. This time, JFK asked Jackie to join him on a double date the following weekend. They went to a carnival in Georgetown. Upon Jacqueline's meeting of Senator John Kennedy again, they began dating. Their romance progressed into engagement, and finally marriage. Jacqueline Bouvier and John F. Kennedy married on September 12, 1953, at Newport, Rhode Island. Their reception was held at Hammersmith Farm, with guests numbering nearly 2,000 people. Together they had four children: a daughter called Arabella Kennedy (stillborn), Caroline Bouvier Kennedy, John Fitzgerald Kennedy Jr., and Patrick Bouvier Kennedy (born and died in August 1963). The marriage had its difficulties arising from John F. Kennedy's affairs and debilitating health problems, both of which were hidden from the public. Jackie spent a lot of time and money early in their marriage redecorating their home or shopping for clothes. They spent their first years of marriage in a townhouse on N Street in Georgetown, Washington, D.C., by themselves. Jackie was fond of her father-in-law, Joseph P. Kennedy, and the affection was returned. He saw the great PR potential of her as a politician's wife. She was also close to her brother-in-law, Robert ("Bobby"). Yet she was not fond of the competitive, sporty, and somewhat abrasive nature of the Kennedy clan. She was quieter and more reserved. The Kennedy sisters nicknamed her "the deb," and Jackie was always reluctant to join in the traditional family touch-football games. Once, she broke her leg in a game of baseball with them. Empress Farah Pahlavi and First Lady Jacqueline Kennedy in a friendly chat. John F. Kennedy narrowly beat Richard Nixon in the 1960 presidential election, and became the 35th President of the United States in 1961. Jackie Kennedy became one of the youngest First Ladies in history. She had taken an active role in the campaign, even speaking to grocery store shoppers over the PA system in one town. West Virginia hit her the hardest as she had not witnessed the kind of poverty that existed there before. Later, in the White House, when the need for new glassware came up, Jackie suggested a company from the impoverished state to supply it. As First Lady, she was forced into the public spotlight with everything in her life under scrutiny. Jacqueline knew her children would be in the public eye, yet she was determined to protect them from the press and give them a normal childhood. She allowed very few photographs to be taken of them and when she was gone, the president would let the White House photographer Cecil Stoughton snap away. Due in part to her French ancestry, Jackie had always felt a bond with France, which was reinforced by her schooling there. This was a love that would later be reflected in many aspects of her life, such as the menus she chose for White House state dinners and her taste in clothing. She spoke French, Spanish, and Italian fluently. She had a strong preference for French haute couture clothes designers, but these clothes were expensive, and she feared wearing them might be perceived as disloyalty to American designers. She often got around such restrictions by having American dressmakers like Chez Ninon in New York copy or adapt contemporary French designs for her. For her state wardrobe, she chose the Hollywood designer Oleg Cassini. During her days as First Lady, she would become a fashion icon domestically and internationally. When the Kennedys visited France, she impressed Charles de Gaulle and the French public with her French. The restoration of the White House was Jackie's first major project. Jackie was dismayed during her pre-inauguration tour of the Executive Mansion, which was conducted by Mamie Eisenhower. The rooms were furnished with undistinguished pieces that lacked a sense of history. Her first efforts were to make the family quarters attractive and suitable for family life and included the addition of a kitchen on the family floor and rooms for her children. Upon almost immediately exhausting the funds appropriated for this effort, she established a fine arts committee to oversee and fund the restoration process; she also asked early American furniture expert Henry du Pont and French interior designer Stephane Boudin to consult on the restoration. Her skillful management of this project was hardly noted at the time, except in terms of gossipy shock at repeated repainting of a room, or the high cost of the antique Zuber wallpaper panels installed in the family dining room ($12,000 in donated funds), but later accounts have noted that she managed the conflicting agendas of Parish, du Pont, and Boudin with seamless success; she initiated the revision of the White House guidebook, whose sales further funded the restoration; she initiated a congressional bill establishing that White House furnishings would be the property of the Smithsonian Institute, rather than available to departing ex-presidents to claim as their own; and she wrote personal requests to those who owned pieces of historical interest that might be donated to the White House. On February 14, 1962, Mrs. Kennedy took American television viewers on a tour of the White House with Charles Collingwood of CBS. At the urging of President Kennedy's ambassador to India, John Kenneth Galbraith, Jackie undertook a tour of India and Pakistan, taking her sister Lee Radziwill along with her, which was amply documented in photojournalism of the time as well as in the journals and memoirs of Professor Galbraith. In Lahore, President Ayub Khan presented Mrs. Kennedy with a subsequently much-photographed horse, Sardar; subsequently this gift was widely misattributed to the king of Saudi Arabia, including in the various recollections of the Kennedy White House years by President Kennedy's friend, the Newsweek and subsequently Washington Post journalist and editor Benjamin Bradlee. It has never become clear whether this general misattribution of the gift was mere carelessness or a deliberate effort to deflect attention from the U.S.'s preference for Pakistan over India during the years when India under Prime Minister Jawaharlal Nehru was attempting to forge a policy of non-alignment vis-a-vis the U.S. and the Soviet Union, whereas American and western public opinion in general was sympathetic to India. Mrs. Kennedy planned numerous social events that brought the First Couple into the nation's cultural spotlight. This appreciation for art, music, and culture marked a new chapter in American history. Jackie's skill at entertaining made guests in the White House feel they were part of a magical evening every time they attended a state dinner. For instance, she orchestrated a dinner at Mount Vernon in honor of President Ayub Kahn, whom President Kennedy wanted to honor for his role in supporting the U.S in a recent crisis; she removed the U-shaped dining table from the State Dining Room, replacing it with round tables that seated eight. Her social graces were legendary, as can be noted from the way she communicated with Nikita Khrushchev in Vienna. The president's summit turned out to be a disaster, and the premier's enjoyment of Mrs. Kennedy's company was subsequently deemed one of the few positive outcomes. After son Patrick's death in August 1963, Jackie kept a low profile at the White House. She made her first official appearance in November when President Kennedy asked her to travel to Texas with him for campaign purposes. She was sitting next to him when he was shot and killed in the Dallas motorcade on November 22, 1963. She led the nation in mourning during his lying-in-state at the U.S. Capitol, during the funeral service at St. Matthew's Cathedral, and finally, while lighting the eternal flame at her husband's grave at Arlington National Cemetery. The London Evening Standard reported: "Jacqueline Kennedy has given the American people…one thing they have always lacked: majesty." A week after the assassination, she was interviewed by Theodore White of Life magazine. In that interview, she compared the Kennedy years in the White House to King Arthur's mythical Camelot, after the Lerner and Loewe musical then playing on Broadway, telling White that Jack had loved the show. She also told White, "Now he is a legend when he would have preferred to be a man." The courage of Jackie Kennedy during the assassination and funeral won her admiration around the world, and many Americans remember her best for her gallantry during those four days in November 1963. Following the assassination, she and her children remained in their quarters in the White House for two weeks, preparing to vacate. After living in the Georgetown section of Washington through the winter of 1964, she decided to purchase a luxury apartment on Fifth Avenue in New York in the hope of having more privacy. She spent a year in mourning, making no public appearances, then zealously guarded her privacy. During this time, her daughter Caroline told her school teacher that her mother cried all the time. Jackie talked of wanting to end her life, but stayed alive for the sake of her children. She perpetuated her husband's memory, however, by visiting his gravesite on important anniversaries and attending selected memorial dedications. These included the 1967 christening of the USS John F. Kennedy Navy aircraft carrier in Newport News, Virginia, and a memorial in Hyannis Port, Massachusetts. In May 1965, Jacqueline Kennedy and Queen Elizabeth II jointly dedicated the United Kingdom's official memorial to President Kennedy at Runnymede, England. This memorial included several acres of soil given in perpetuity from Britain to the U.S. on the meadow where the Magna Carta had been signed by King John in 1215. She oversaw plans for the establishment of the John F. Kennedy Library, which is the repository for official papers of the Kennedy administration. Original plans to have the library situated in Cambridge, Massachusetts, near Harvard University, proved problematic for various reasons. The library, designed by I. M. Pei, includes a museum and was dedicated in Boston in 1979 by President Carter, nearly 16 years after the assassination. The governments of many nations donated money to erect the library, in addition to corporate and private donations. On October 20, 1968, Jackie married Aristotle Onassis, a Greek shipping tycoon, on Skorpios, Greece. Four and a half months earlier her brother-in-law, presidential candidate Robert F. Kennedy, had been assassinated in Los Angeles. At that point, Jacqueline decided the Kennedys were being "targeted," and that she and her children had to leave the United States. Marriage to Onassis appeared to make sense: he had the money and power to give her the protection she wanted, while she had the social cachet he craved. Jackie lost her entitlement to Secret Service protection and franking privilege, to which a widow of a president of the United States is entitled, upon her marriage to Onassis. For a time, the marriage brought her adverse publicity and seemed to tarnish the image of the grieving presidential widow. However, others viewed the marriage as a positive symbol of the "modern American woman" who would not be afraid to look after her own financial interests and to protect her family. The marriage initially seemed successful, but stresses soon became apparent. The couple rarely spent time together. Though Onassis got along with Caroline and John, Jr. (his son Alexander introduced John to flying; both would die in plane crashes), Jacqueline did not get along with step-daughter Christina Onassis. She spent most of her time traveling and shopping. Onassis was in the early stages of filing for divorce when he died on March 15, 1975; Jacqueline was with her children in New York. Her legacy was severely limited by a rumored prenuptial agreement and by legislation that Onassis had caused the Greek government to approve, which limited how much a non-Greek surviving spouse could inherit. Jacqueline eventually accepted Christina's offer of $27,000,000, waiving all other claims to the Onassis estate. She spent her later years as an editor at Doubleday, living in New York City and Martha's Vineyard with Maurice Tempelsman, a Belgian-born, married industrialist and diamond merchant. Jacqueline Onassis appreciated the contributions of African-American writers to the American literary canon and encouraged Dorothy West, her neighbor on Martha's Vineyard and the last surviving member of the Harlem Renaissance, to complete The Wedding: a multigenerational story about race, class, wealth, and power in the United States. The novel received great literary acclaim when it was published by Doubleday in 1995 and Oprah Winfrey introduced the story in 1998 to millions of Americans via a television film starring Halle Berry. Dorothy West acknowledges Jacqueline Onassis's kind encouragement in the frontispiece. In the late 1960s she helped lead the historic preservation campaign to save New York's beloved Grand Central Terminal from demolition. In the 1980s she was a major figure in protests against a planned skyscraper at Columbus Circle that would have cast large shadows on Central Park. From her apartment windows in New York she had a splendid view of a glass-enclosed wing of the Metropolitan Museum of Art. The wing displays the Temple of Dendur, a gift from Egypt to the United States in gratitude for the generosity of the Kennedy administration. American money had been instrumental in saving several temples and objects of Egyptian antiquity that would otherwise have been flooded following construction of the Aswan Dam. In January 1994, Jackie was diagnosed with non-Hodgkin's lymphoma, a form of cancer, but it was not announced to the public until February of that year. The family was initially optimistic and her daughter Caroline made Mrs. Onassis promise her that she would ditch smoking, which she did. She continued her work with Doubleday, though she curtailed her schedule greatly. By April 1994, Mrs. Onassis knew the end was near as she had a bout with pneumonia, an ulcer, and the spreading of her cancer. She made her last trip home from the hospital on May 18, 1994, and died the following night at her Fifth Avenue apartment in her sleep at 10:15 P.M. on May 19 of that year. Onassis was only 64. Her funeral on May 23 was televised around the nation and world, even though it was essentially a private funeral, as was her own wish. She was buried beside her assassinated husband at Arlington. ↑ Seventh Seal RootsWeb.com. Retrieved April 10, 2007. PDF file: Kennedy Assassination Chronicles (Fall 1995) - contains much of "the Camelot interview." History of "Jacqueline Kennedy Onassis"
This page was last modified on 13 March 2018, at 15:36.